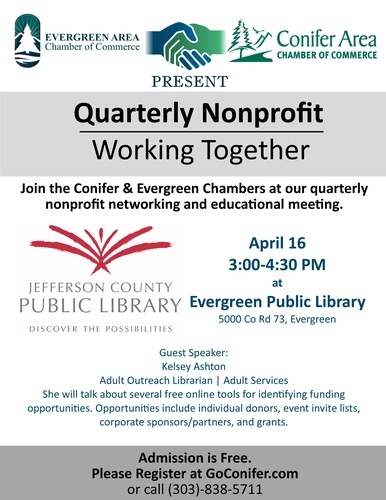 Join the Conifer & Evergreen Chambers at our quarterly nonprofit networking and educational meeting. Our guest speaker is Kelsey Ashton, Adult Outreach Librarian/ Adult Services. She will talk about several free online tools for identifying funding opportunities. Opportunities include individual donors, event invite lists, corporate sponsors/partners, and grants.